Secrets 'n' stuff! Maybe we'll get to see what's happened to Skitter! Bunker stands up to Robin! Solstice gets some screen time! Speaking of Solstice, when is she getting her light powers back? But I am loving that they're staying with the costumes from The Culling! So cool! MAWWAGE. 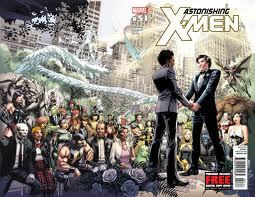 Yes, Northstar ties the know in what is the COMIC OF THE YEAR. 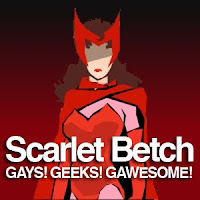 What's that AvX? You think you stand a chance? Only if Scott dies, Jean comes back to life, Emma starts leading Utopia, and Xavin comes back from space and Northstar has to get REMARRIED because Xavin missed the first one. Oh, and Kyle has to get his own Kevin Keller-esque spin-off title. BUY THIS BOOK <3. Penultimate chapter and lots of Killer Croc! This version of the Croc TERRIFIES me. Also, I hope Batwoman's new flirtation K.O.s her current relationship. Batman's most interesting relationship is with Catwoman, not Commissioner Gordon. QED, ditch the cop and pash the criminal, Kate! Can Diana be saved from being Hell's wife???? The X-men come for Justin's Sentinel. Is this story logical? Yes. But is it going to be interesting? Beach day! Plus Jason and Cheryl Blossom show up to mix it up with the new kid! I can't wait to read this issue so that I'll have something to base my Jason/Kevin fanfic around! EDIT: Jason wasn't in this issue! I guess I'll just have to write the next best 'ship: Wendy/Sloan! It's back to NYC for Kitty Pryde's transformation from homeless youth to fugitive! 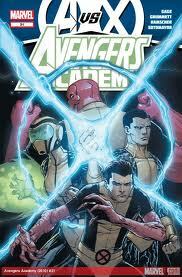 (Colossus probably won't be in this issue. But you never know!) Edit: Now we know: there's no C-boy. But Kitty is bad-as this issue! We're back with another great episode. This week we discuss the two big queer comic news points this month that everyone seems to be talking about: Northstar's impending nuptials and the newly queen Alan Scott aka the original Green Lantern! OH AND BY THE WAY GUYS THE WATCHMEN PREQUEL MINUTEMEN CAME OUT TODAY! I am very excited for this origin issue! First Earth 2 Flash is empowered by the Greek Gods (much better than the speed force), now a gay Alan Scott is going to get magical flame powers (and does his armor look a little Parallax-y to you? ), and have you even SEEN the new Hawkgirl?? The Earth 2 Trinity is all about empowering minorities (and Judd Apatow's version of Jay Garrick. [I understand that "diversity" encompasses EVERYBODY, but... SIGH.])! I know you shouldn't judge a book by its cover but... this series looks so good!! Harry Tanner is back! His story thread is kick-as: the Prince of Lies is an excellent nemesis for the historically over-powered Stormwatch crew and I can't wait for the Projectionist to screw him over! So far we've established that Stormwatch and Harry are in a race against each other to find all these powerful hallows artifacts, but we haven't seen one yet... Maybe this is the month we do! Banshee, Wolfsbane, and Polaris take a road trip so that Rhane will stop flagellating herself over birthing a demon-god. Maybe Rictor and Shatterstar will be able to have a date night while they're out! Yeah, I realize that's only going to happen if their dinner is interrupted by a slathering wolf-bear king, but I can dream, right? I picked up the last issue because it seemed like a good jumping on point, and now I'm just waiting for the half-price sale so I can buy the whole series! Spot's crush on a gay guy who houses a (straight) vigilante ghost is so perfectly angst-generating that I have to read its genesis! AND it's great for bringing up the "Two-Spirit" part of the LGBTQIAT-SAetc soup! Also they're gonna fight an elder god soon so... Bonus Points for Cthulhus! Speaking of self-parody, have you seen the cover of this issue? It's like... WHAT? Who green-lit this idea????? ?